The Prescott Area Celiac and Gluten Free Support group held its August meeting/luncheon yesterday at Prescott Public Library's Founder's room, "B". The meeting was well-attended, with approximately 20 in attendance. Welcome to our newcomers! While the group grazed on an assortment of snack foods and special gluten free (and sometimes yeast free, casein and dairy free) options, several topics were discussed. The group was informed about the new blog site, so that folks can begin checking the blog for updates and current info about the group. A calling card has been created with the group's logo that can be handed out to others in the community who may be interested in coming to the group. There will be more printed cards available at the next meeting, or they can be printed out for each group member's own use. Information was shared with those in attendance about several gluten free products that are now available in our community. Costco is currently carrying "Go Picnic", a fabulous gluten free option for an on-the-go snack or for travel. The new Natural Grocers store was mentioned in regard to several new GF options that are now available there, such as Canyon Bakehouse breads, which many were in agreement as being the best GF bread currently available in the market place. 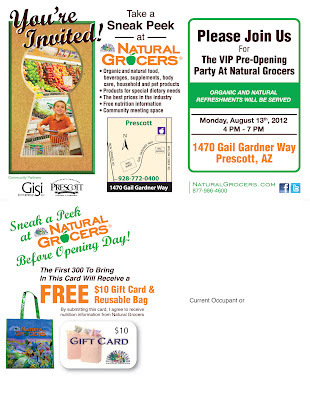 Natural Grocers has extended an invitation to the group for a tour of its store and its gluten free offerings. There was discussion about a recent AP Prescott Courier article (August 12th) in the Sunday Vitality section about the increasing prevalence of those who are desiring to eat gluten free. The article also mentioned information about GMO (genetically modified organisms) in wheat. There was an in depth discussion about celiac DNA testing and an informative sharing of up-to-date information about this topic by Linda Cook. Next meeting is 9/18 at 12:30 PM with topic to be announced. Please let us know your thoughts on these topics. You can leave comments at this blog site. Please join our Prescott Area Celiac and Gluten Free Support Group at the new Natural Grocer's pre-grand opening on August 13th, from 4-7PM. The store is located at 1470 Gail Gardner Way in NW Prescott. The first 300 people in attendance will receive a gift from the store, and those who have their invitations with them will be able to be part of a drawing for a valuable prize! Just print out the info in the photos shown here and bring with you!